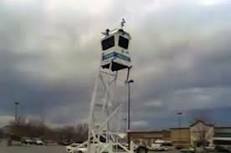 You are here: Home » Guard Towers popping up at WalMarts !!!!! Pictures !!!!! Guard Towers popping up at WalMarts !!!!! Pictures !!!!! ANOTHER PORTABLE GUARD TOWER AT A WALMART, AND THIS WALMART IS CLOSED! Location is in KALISPELL,MONTANA.They closed this WALMART down a few years ago, to open a SUPERWALMART here. Uh, so IF it’s CLOSED, WHY DO THEY NEED A PORTABLE GUARD TOWER IN FRONT OF IT??? This guard tower looks JUST LIKE THE ONE I POSTED EARLIER OF A GUARD TOWER at the WALMART IN HICKORY, NC! THE PLOT THICKENS SURROUNDING WALMARTS AND THEIR ROLE UNDER MARTIAL LAW! Here is the mobile guard tower at the WALMART IN HICKORY, NC! They are popping up EVERYWHERE! I just saw one at the Transportation Center in Camden Nj on Friday. Hey Martha, that’s crazy. I grew up in Camden. It has been a while since I’ve been back.